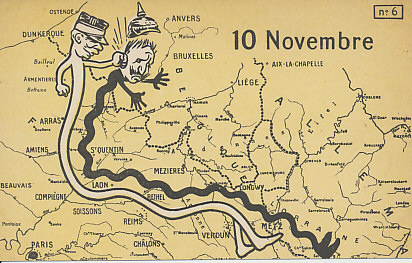 The Blow on the Yser, November 10, 1914, the sixth in a series of six postcards on the German invasion of France and the forming of the Western Front. The snaking bodies of French commander Joffre and German Kaiser Wilhelm turned to the north after the Battle of the Marne, shaping the Race to the Sea. Joffre has struck the Kaiser a roundhouse blow, sending his helmet flying. In the Battle of the Yser, the Belgian army, determined to hold native ground, inundated the coastal lowland along the Yser River. Behind Joffre's head is the small corner of Belgium they held throughout the war. Ehrmann, Édition Lorraine, a set of six postcards and envelope. 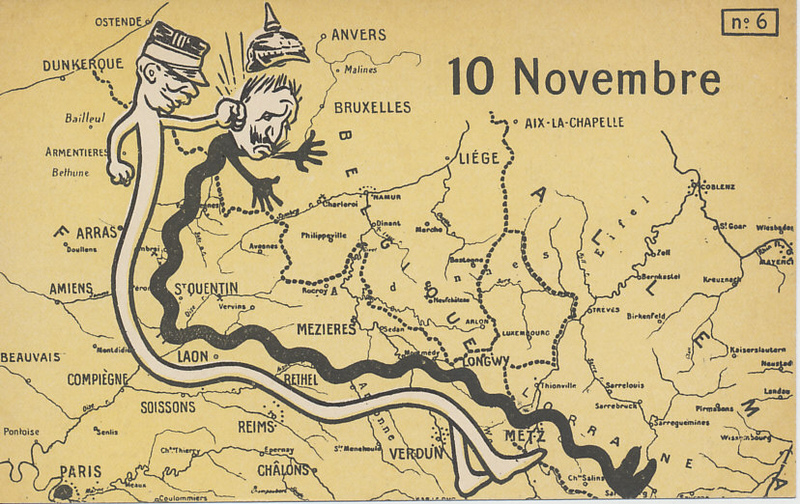 Over maps of the French theater of operations on the western front in 1914 — Luxemburg, Belgium, northern France — cartoon figures of the French and German armies struggle. General Joffre represents the forces he commands. His adversary's upward-pointing mustache indicates Kaiser Wilhelm. 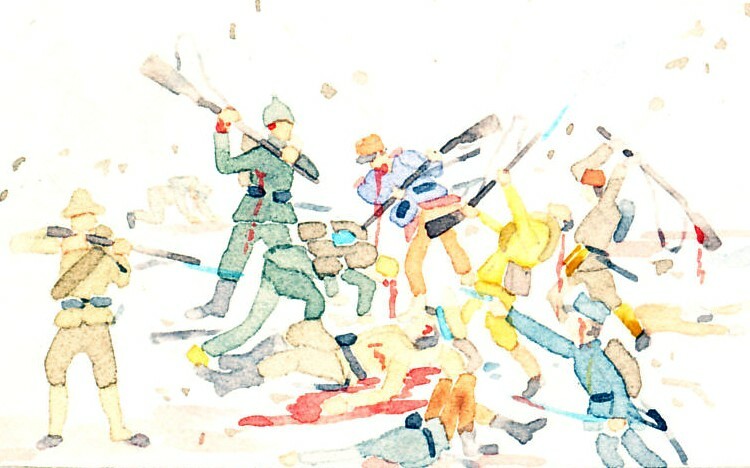 From "L'Attaque & la Riposte — Originale présentation des phases de la Guerre" — The Attack and the Retort — Original Presentation of the Phases of the War — a set of six postcards and envelope by Ehrmann, Édition Lorraine. No. 6. Le Coup de l'Yser, the Blow on the Yser. The titles of the cards appear only on the envelope: No. 6. Le Coup de l'Yser. Tous les Pays étrangers n'acceptent pas la Correspondance au recto. (Se renseigner a la Poste). After the Battle of the Marne, the enemy lines ended in open country near Noyon on the Oise River. When French commander Joffre suspended his assault on the German defensive line on September 14, the opponents tried to outflank each other, forming a line that moved north, with battles in Picardy, from September 22 to 26, crossing the Somme west of Péronne, passing into Artois from September 27 to October 10, east of Albert, west of Bapaume, through Arras, west of Vimy, through Lens and Loos, east of Festubert, through La Bassée, east of Neuve Chapelle, west of Lille, across the Lys River and into Belgium, along the Yser River to the English Channel from October 18 to November 24. In September, the Belgian Army had retreated to Antwerp, from which they had harried German forces. Britain had attempted to aid the defense, aid the French considered hopeless in light of the falls of the other Belgian fortresses. But the French wanted to preserve the Belgian Army, and sent reinforcements to them. The Belgians retreated from Antwerp on October 6, moving to the coast and towards France, helping hold the coast and the Channel ports of Nieuport, Dunkirk, and Calais. From October 16 to 31 the Belgian Army fought the Battle of the Yser in the lowlands along the river. Struggling to hold their line, the Belgians opened the floodgates of the river, inundating the low-laying countryside. Stopped at the coast, the Germans turned inland, where the British were trying to advance. In the First Battle of Ypres, the British cracked and broke, falling back until strengthened by French reserves. “The British regular army was shattered”. In late November, the fighting slowed. In the course of it, German forces had seized much of the high ground in the flat and gently sloping terrain: Loretto Heights, Vimy Ridge, Messines Ridge. At the end, an entrenched line stretched from the Channel to Switzerland, the Western Front.